I'm obsessed with Ramen, so I'm kicking off my Sunday Supper Series with a recipe that will not disappoint. I'm a huge fan of dishes with components that can be re-used later in the week and this is one of them. A big pot of soup that you start earlier in the day filling the house up with the best aromas is exactly how I would like to spend my Sunday. I'll be featuring a huge array of recipes during my Sunday Supper series from super simple family friendly recipes to more complex and impressive dishes for holiday's or intimate parties. This isn't the simplest recipe by far, but I have had a lot of people ask about it after I posted the meal on my instagram. Don't be scared off by the long list of ingredients, some can definitely be left out and still be a successful dish! Follow along and comment with questions! Ramen noodles, I found some handmade noodles that was frozen in the Japanese market. Okay that was quite a list but I promise it is worth it! You can absolutely simplify your recipe making a simpler chicken broth. I would say the key is cooking your broth for a long period of time to really let the flavors develop. Even if you maintain a simpler broth of chicken, onions, carrots and garlic if you cook it for a long time you will still produce great flavor. Okay here we go! Okay this is the easy part, throw all of the ingredients listed under "For the Broth" into water. I make a lot because I like to save extra for later in the week for other recipes. Make as much as you need or want. Let the broth simmer as long as possible. 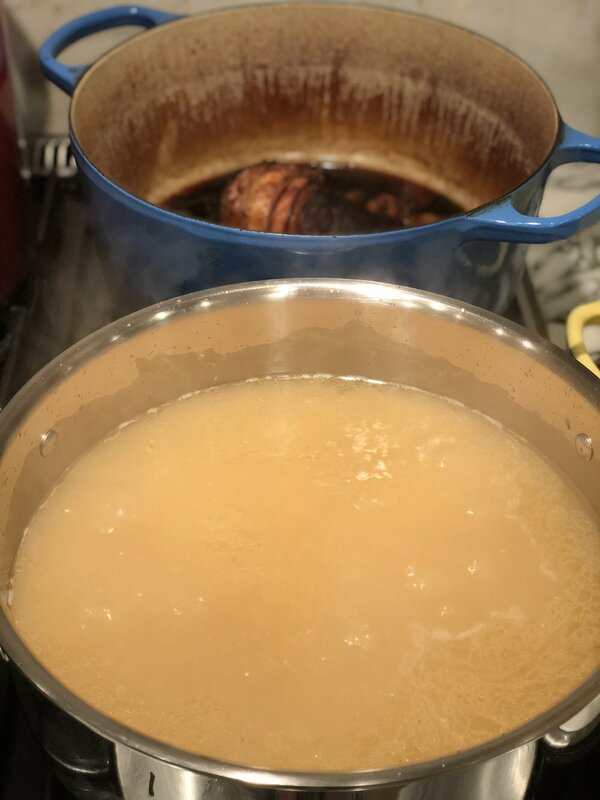 I would say 4-6 hours is ideal on simmer after it comes to a boil but if you really want a rich broth start yours first thing in AM and cook for 10-12 hours. I have done both, and they are each really good. The chashu pork needs about 3-1/2 hours to cook so start it about that much time ahead before you want to eat. This dish, like the broth needs time. The good news is, despite the list of ingredients required there is little chopping. Just throw it in the pot and let it do its thing! Take all of the ingredients besides the pork belly and throw it in pan/pot with lid that is oven safe. Then you want to roll the pork belly into a tight cylinder and tie it up with cooking twine. No fancy method here. This ensures that it cooks evenly and produces a more tender texture. For cooking set the oven to 275 degrees, add pork belly to broth and simmer for about 3 1/2 hours (lid on in oven). If you have time time after it comes out, let it rest in its own liquid while preparing rest of the meal. Okay next step is straining your broth. I store the chicken separately to use for another dish later in the week. Simply poor your broth through a cheesecloth or fine mesh strainer throwing out everything besides the chicken. Season with soy sauce or kosher salt to taste. Next up...prep, chop and put your ramen toppings aside so its ready to go. I like to do this an hour before my soup is ready so all I'm doing is assembling at the end. Last step (which is also optional) is that soft to medium boiled egg. Here are my recommendations on how to get a perfectly soft or medium boiled egg. Place eggs in saucepan covering them with cold water by about 1 inch. Cover pan with a lid and bring water to a boil once rolling cover with lid and turn off/remove from heat. Now that this is done I put aside as much broth as I think I need for the meal and bring to rolling boil saving the remainder of broth for later, drop the noodles in for a couple minutes until done and divide into bowls and top with our veggies. Slice your Chashu pork and lay on top with your sliced egg. Done! This meal has so much flavor and as much as I like to drop in and order Ramen to go from a restaurant this dish makes the house smell so good and you have plenty of left over broth for other dishes later in the week. Hope you Enjoy! See below for resources. Bowls are from my local Japanese marketplace (find something similar on Amazon here)/Napkins are Walter G. and you can buy other similar styles they make from our shop/wood chargers from Potterybarn and can be purchased here.